Honey! They shrunk the SUV! Monsoon season is the time to celebrate, the time when the scorching heat gives way to cool showers and the moist breeze ushers in joy all around. People welcome rains with a festive spirit marked by fun, merriment and, of course, a variety of lip-smacking foods. Rajesh Vashishth thinks in the language called comedy. This young scriptwriter, who forayed into Punjabi serials and films after having acted in Shyam Benegal’s biopic Netaji Subhas Chandra Bose: The Forgotten Hero and serials like Office Office with Pankaj Kapoor, Koi Apna Sa on Zee TV and Punjabi serials Santa Banta 009, Ajj Nahiyon Ladna, wanted the freedom to express himself completely and say all that he wanted to. 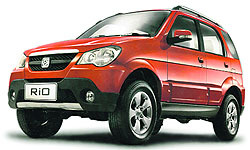 Leading the charge, is Premier Automobiles, India’s oldest car manufacturer. Their newest offering is the Rio. “India’s first – and only compact SUV !”, it claims. It was just that, a CUV. Cute Utility Vehicle! The exterior is dimunitive with clean-cut clear lines that give it good handsome looks. The spare wheel mounted on the rear confirms it is a SUV. The Christmas tree rear-lights and the high-mounted brake light also adds to its good looks. Indicator lights are mounted in the outside rear-view mirrors (ORVM). Both the ORVMs can be adjusted electrically. Roof rails are standard, as are fog lamps. Rear wiper is with washer, rear window demister. Almost everything found on a high-end SUV is in the Rio. It has electric power steering, power windows and A.C. For safety, there are emergency locking retractor (ELR) seatbelts with pretensioners, side-impact protection beams (S.I.P. ), brake assist, ABS with EBD. It has disc brake up front, supported by a McPherson Strut suspension. It is shod with 205/70R 15 tyres. With a ground clearance of 200mm, it will tackle Indian pot-holed roads with ease. If the exterior is small, the interior is spacious. The Rio seats five persons comfortably. The rear seats folds down to provide extra storage. The interior is simple yet functional. It will be a great car for the city, being small yet big! The Rio has a varied pedigree. It’s a Daihatsu (read Toyota), which is Japanese, but made in China. The body shell is shipped to India to be assembled in Pune with an Italian engine. It could well support the “Made in Globe” badge! Whatever be its badge, the Rio is a trendsetter and will create a new segment for the automobile in India. The Rio is available with both a petrol engine, 1173 c.c and Euro lV compliant. The new diesel engine, the Fiat CRD; multijet 1300cc BS IV compliant will be available in August this year. According to a dealer, service of either vehicle will be less than Rs 1,500. With prices ranging from Rs 6.3 lakh for the petrol to Rs. 7.3 lakh for the diesel Rio, Premier may have a winner in its stable. Is it a CUV? No! Is it a SUV? No! Is it a MUV? No! So what is it? It’s a LUV! Life Utility Vehicle ! It is the latest from Maruti Suzuki and sets a new benchmark in the compact SUV segment. Built on the Swift platform, with a monocoque body, it has a car-like ride and handling with UV like space. The looks are undoubtedly SUV. It is a seven-seater, with three rows of seats. In spite of the huge interior space, it is compact on the outside. Maruti has borrowed from its parts from its others cars. 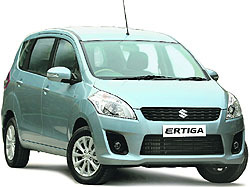 The Ertiga is an almost Ritz-look-alike head on. The swept back headlights are Swift inspired. The large ‘S’ on the front grill is the only chrome on the entire car. If the exterior is rather common-looking, ihe interior has some interesting features. The driver’s seat is ergonomically designed and has six adjustments. You can sit high up and have a grandstand view of the road. It has tilt steering and internally adjustable ORVMs. It has two air bags for the driver and the co-driver. The centre row of seats has a centre arm-rest. The seats slide and have reclining seat backs and adjustable head rests. A 60-40 split creates more space with the third row folded flat. The third row of seats also has an arm-rest and ample leg room — not available in the some larger SUVs. Due to the sloping roof, the third row is a two seater. Most interesting is that that the second row of seats slide forward 240mm to make access to the third row easier. In some SUVs you have to be a contortionist to get into the third row of seats. In the 1920s and 1930s some American cars had a rear seat, which was almost impossible to access. It was called the Mother-in-Law seat! It may be a compact but is probably the most “loaded” of any of the regular SUVs. Here is what the Yeti boasts off — ABS, EBD, HHC, EDL, TCS, ESP — This is what it means. Anti-lock brakes, electric brakeforce distribution, hill-hold control, electronic differential lock, traction control system, electronic stability program, that’s the ESP. It could well be extra sensory perception considering how the 4x4 intelligent system works. The Yeti has permanent 4-wheel drive. The power comes from a 2-litre turbo-charged diesel engine placed transversely in front, 90 per cent of the power goes to the front wheels,10 per cent to the rear. In case of an emergency, like a skid or while off roading, the intelligent selector will transfer power to the rear wheels. 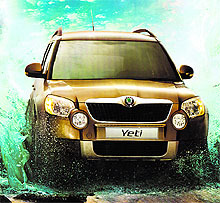 The 4x2 Yeti has a five-speed gear box and the 4x4 is a six speed. The VarioFlex Space Management is another unique feature of the Yeti. The rear seat is in three pieces. All seats can be moved forward, backward or sideways! The backrest can be tilted backwards or forwards or folded flat. One, two or all three seats can be removed to make a canaverous space at the rear. Both front seats have height and lumber support adjustment. When the Yeti was launched the word compact’ had not found favour. It was a cross-over. Storage space is ample. There is storage under the front passenger seat, on top of the dashboard, the glove box has cooling facility as is the storage in the front arm-rest. The luggage compartment at the rear has space under the floor board. Fuel consumption is also reasonable. 90kmpl on the highway and 13-14 kmpl in the city. It really is a fantastic performer, on road or off-road. However, it is as elusive as the Abominable Snowman after whom it is named. The reason being the price, which is in double-digit figures and that too at the higher end. If rains are the time to cut loose and get wet they are also the time to look stylish and trendy. For many leading designers, this is the time to get bold and startling in the choice of apparel. A number of them introduce special collections for the occasion. But more than apparel, it is monsoon accessories that are the flavour of the season. Beaded necklaces, bangles and bracelets in bright colours; trendy clothes like Bermudas, dungarees and capris as also conventional raincoats, hooded jackets, trench-coats and neon-coloured umbrellas. It is not just the designers, even the world’s leading fashion houses bring out a line of special monsoon wear. Umbrellas designs change season after monsoon season. Renowned couturiers like Prada, Gucci, Louis Vuitton, Dolce & Gabbana, Hermes Birkin, Pierre Cardin, Versace, Yves St. Laurent and a host of others bring out designer umbrellas that are a much-awaited annual event. These umbrellas cost between Rs 500 and Rs 50,000. These can also can also be occasion-driven. 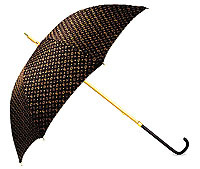 Louis Vuitton, for example, offers special umbrellas for avid golfers. Yves St. Laurent brings out the Love Series Umbrellas, which, users say, will make you want to just fall in love during the rainy season. Gucci has introduced umbrellas for special occasions like On-the-Go Luxury Umbrellas to go with evening wear and the executive-look umbrella for the office. If umbrellas are making a designer statement, can raincoats and trenchcoats be far behind? A number of leading companies have brought out designer-wear raincoats that can be had in a range of styles, colours and prices. British fashion house Burberrys is clearly the leader in designer raincoats, though a host of other leading companies are lapping at its heels with their creative offerings. In these times of conspicuous consumption, designer rainwear does not end with umbrellas and raincoats. Companies are milking the market with a host of monsoon-related accessories. Gum boots, for example, are suddenly back in fashion. But these are not the dowdy, utilitarian black shinies that were worn a generation back. The new boots are multi-hued and elegant and come in a range of stylish fashion accessory. Apart from stylish rainwear, there are a number of other imaginative accessories in the market. Like adults, children need protection too. In fact, toddlers need it more than adults. Keeping that in mind, companies like Sasha, Avocent and Maclaren have hit the jackpot with stroller covers and canopies. These are designed in such a way that they not just offer complete protection from rain but also allow babies to breath comfortably and see the world around them. Then there is a big market for mobile rain protectors. Especially the high-end handsets like the iPhone. Owners fearing damage to their phones, go in for covers which have now become designer business. 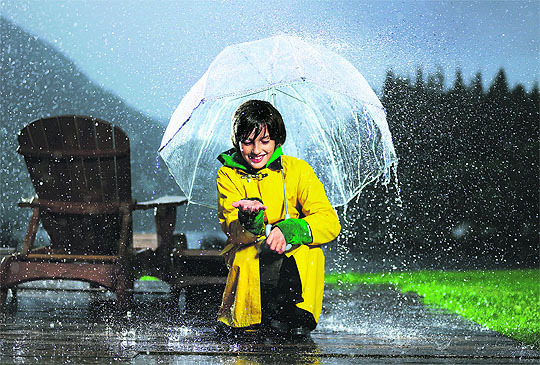 Companies like Nelson Aqua, Otterbox Armor and many more are offering elegant rain protection in contemporary styles. The monsoon season indeed has become a fashion event not just in apparel but also in haute rain couture, which reflects the mood of the season which is essentially romantic and fun-filled. Here’s looking at some of the monsoon essentials…. Besides protection if you are looking for style and oomph this monsoon, go for an umbrella that has the signature Louis Vuitton monogram. Umbrellas from the French fashion house are trendy and exclusive and spell both class and elegance. Louis Vuitton has a range of styles, even offering a silk parasol with UV protection and another one to be specially used when playing a game of golf. These designer umbrellas may burn a small hole in your pocket — but then, what’s a few bucks when you want to bring back the romance and magic of rain in your life? Want to capture the rain in all its glory but fear that you will ruin your camera if it gets wet? Fear no more. The Pentax Optio W60, with its fully waterproof body is not just rain-safe but can survive even it is fully submerged in water. The 10-megapixel point-and-shoot camera, with a 5x optical zoom and 2.5-inch screen, has a strong body and can survive multi-terrain extreme weather conditions and will even work in temperatures of up to -10°C. Its versatility can be gauged from the fact that it is capable of operating underwater to a depth of four metres for up to two hours, all the while taking quality pictures. Is the rain preventing you from taking your little one out for a stroll? Now you can protect your child from rain and other natural elements with Sasha Kiddie Products’ Jogger Travel System Rain Cover. 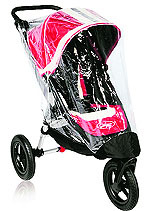 The rain cover fits all standard-size strollers and can also protect the baby in the car seat. It is see-through and comfortably breathable as strategically created vents ensure good air circulation. It is lightweight and easy to attach with Velcro. With this cover you need not fear the prospects of a sudden shower when you are pushing the stroller. Be sure it will not just protect, but also allow the baby to look out at the world, and at you! A laptop is as much a part of urban life as a mobile, and it, too, requires protection during the monsoon season. The Armitage Laptop Backpack offers an excellent protection for your computer. The lightweight (1.8 kg) backpack has a side- entry access, with a detachable computer sleeve that protects your laptop. There is also a front organiser with storage space for media devices, cellphone, business cards, key holder and pens. There is a front zipper pocket for small miscellaneous items and a compartment for documents. The side zipper pocket is made for an MP3 player, complete with a slit for ear phones. This backpack is just not a rain-proof laptop protector but a virtual Pandora’s Box for essential knick-knacks. Incessant rains can spell doom for the handbag. There is usually nothing that can be done about it once the handbag is drenched. 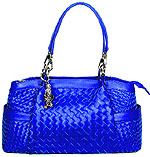 But now you can rest your fears as Cheemo is offering waterproof Gabana Weave Bag. Made from top-quality leather, this bag is fully hand-braided. 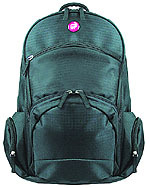 It has two side pockets and elegant short handles. It can be carried as a day bag as well. It’s a jacket that has been created to preserve the body from rain and humidity. The Armani Hooded Rainproof Jacket has a full-front double-ended zip fastening with a metal Armani logo zipper. 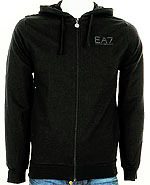 The funnel-neck design conceals a hood which is accessible by a full-zip fastening. It has two pockets on the waist, both with a side-zip entry and black metal-logo embossed zippers. The jacket has elasticated cuffs on the long sleeves and waist band for an expanding snug fit, which along with the light-weight polyester fabric, allows the jacket to be worn for sporting activities as well. The hooded jacket also has a large Armani logo in silver printed on the reverse. If you need protection from the monsoon, so does your iPhone. In fact, it needs bigger care as rain and moisture can damage it permanently. 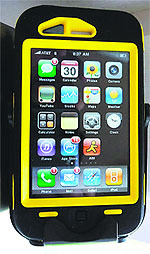 That’s where the Otterbox Armor’s Waterproof Case for your iPhone comes in. The case provides a completely water, sand, dirt and dust-proof enclosure. Made from an ultra rigid, crush-proof and unbreakable moulded polycarbonate shell, it offers internal shock protection system from extreme impacts and drops. The headphones connect directly to the jack. It is guaranteed for life and adds value to the iPhone. 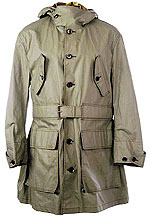 Go several notches up on the style quotient with this Multi Pocket Hooded Raincoat from Burberry. The lightweight raincoat has a detachable check-trim hood, point collar, throat latch closure and a rain guard. It has a concealed zip through fastening, snap-button fly, epaulettes and gun flap. Its multiple pockets, elasticated cuffs, metal buttons and buckle engraved with the Burberry Brit logo give it a class of its own. This super stylish coat is a must-have for any fan of the brand. You can layer it over your favourite two-piece suit for that elegant and faultless finish. This footwear is guaranteed to make you stand out like Puss in Boots. Italian designer Regina Regis has given a new life and identity to rain boots. Combining elegant forms and an element of fun, the boots are available in all colours of the rainbow apart from black and white. 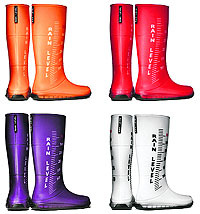 They are not just amazingly stylish but have been an instant hit and have brought rain boots back in vogue. The funky centimetre ruler at the side will let you know the exact water level on the road. And when it comes to the 35-centimetre mark it might be time to wade back home in almost thigh-deep water. Rajesh Vashishth thinks in the language called comedy. This young scriptwriter, who forayed into Punjabi serials and films after having acted in Shyam Benegal’s biopic Netaji Subhas Chandra Bose: The Forgotten Hero and serials like Office Office with Pankaj Kapoor, Koi Apna Sa on Zee TV and Punjabi serials Santa Banta 009, Ajj Nahiyon Ladna, wanted the freedom to express himself completely and say all that he wanted to. Having scripted films like Chak Jawana and serials Saude Dilan De on Channel Punjab of UK, Hasde Hasaunde Raho on Mh One, laughter show The Great Punjabi Comedy Show anchored by Gurpreet Ghuggi, Rajesh has once again scripted success with a character called Happy Singh on a popular television channel (Mh One). He has made animation in Punjabi come alive with Happy Singh. Rajesh is based in New Delhi and is a product of the Department of Theatre and Television, Punjabi University, Patiala. He belongs to Barnala in Punjab. The idea was already there with the producers but Rajesh to gave it life. Not satisfied with just scripting for it, Rajesh is the voice behind the character, too. Thanks to him, we have a Happy Singh who also sang Blackberry D based on Kolaveri D, which was a great hit on the Internet. 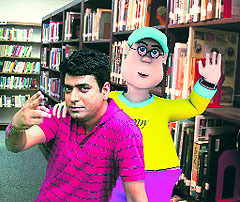 Rajesh has also rendered his voice for Happy Singh’s pet. “When I started even I did not fathom that the character would be such a great hit. Now celebrities like Punjabi singers want Happy Singh to crack jokes about them or their work so they can reach out to Happy Singh’s audiences,” says Rajesh. Now this Singh is very Happy making a statement through the eyes of a goofy teenager that too through jokes, says Rajesh. “The USP is that the character is an animation and does not make any heavy-duty statements,” says Rajesh. “The scope is wide, move it anywhere, no limitation, expression wise too. On June 1, Happy Singh completed one year. He has 35 to 40 pages on Facebook. “I made a page on him too but he has better patrons in others. The number of likes he enjoys is heartening,” says Rajesh. Rajesh did not just give life to the idea of Happy Singh but he also created a world around him like Happy Singh’s love interest Billo, her cat Mili and his sidekick and dog Sheru. Mild in his sarcasm and goofy in his demeanour, Happy Singh continues to win hearts all around. Is there any place to go where you can forget all your worldly troubles and anxieties? Luckily for you, there is one still available. 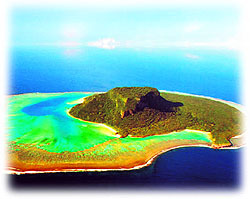 Vatu Vara Island, near Fiji, is one of the very few freehold islands up for sale in the world. It is three km in diamer and also has a 305-metre-high hillock. Because of the peculiar shape of its summit, it is also called the Hat Island. You can lounge in the sun the whole day and when you are tired of resting you can climb the summit and say ‘Hi’ to your immediate neighbour who owns Mago Island just a few kilometre away. And guess who he is — none other than Hollywood star Mel Gibson! It’s a golf cart that would put a Cadillac to shame. 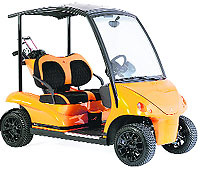 In any case the price of the Garia golf Car is almost the same as any limo. Its framework is provided by Aston Martin and Volvo’s supplier and its gearbox by Ducati’s supplier. It comes fitted with a built-in refrigerator to keep your beverages chilled along with strategically-located cup holders. There are plush, adjustable seats and heated, tinted windows. Valmet Automotive, the Finnish company that has made this car says that it could even be roadworthy in many cities as it comes with headlights, taillights, turn signals and a sun roof. So, no matter what your handicap, here’s your chance to be the envy of the golf club. It’s a new-generation watch that cordlessly connects to a smartphone. 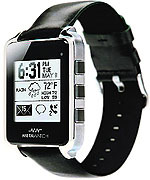 It provides an interface which can be worn on the wrist that will display information from the mobile. The Meta Watch lets you check your mail that starts streaming on its dial. The Bluetooth 4.0-enabled digital wristwatch from Fossil is compatible even with iPhone 4S and third-gen iPad for alerts, notifications and messaging. It is water-resistant and has an ambient light sensor and rechargeable battery. Time was when a picture was worth a thousand words. Not any more — at least in the traditional sense of the word. Now with the arrival of the digital camera, the art of clicking pictures and developing them “film style” may be a thing of the past. But that is not to say that the charm of the manual cameras is wearing off. Far from it. In these days of instant photography, if you possess a Daguerreotype old-fashioned camera you could become a millionaire many times over. These cameras were manufactured in the early 1830s and today there are so few in existence that they are sold in exclusive auctions as vintage objects of art. The last one fetched a king’s ransom at a recent auction in France. If you have a penchant for things vintage, click the buy button on one of these auctions and display the Daguerreotype in your living room. It would an instant conversation piece. We’ve all heard of the man with a golden gun, but a man (or, for that matter, a woman) with a pair of golden sunglasses ….that should be a first! The 18-carat gold eye coolers are the brainchild of American jewellery designer Hugh Power and gold retailing company Click Gold. The glasses, which come with a lifetime warranty, have gold-tinted lenses and are unbreakable and non-scratchable. Each pair is handcrafted and takes over 50 hours of fine workmanship to be readied. It even has an 18- Karat gold extendable sidepiece and an 18-Karat gold expandable back. If you have moolah to burn, here’s your chance to become a golden eye! Toucans are a cross between a parrot and a woodpecker and are only found between Mexico and northern Argentina in the Amazonian rainforest. But you can now bring the rarely sighted bird home. Swarovski has crafted the magnificent Toucan in faceted black diamond crystal with eyes in erinite crystal, bill in green beryl and topaz and peacock blue crystal. The bird is perched on a fancy stand and is guaranteed to perch you on top of the social pecking order. It’s as close a shave as you can ever dream of. And your mug better be worthy to be shaved with Zafirro Iridum Razor. In fact the mega-rich celebrities, who use this razor, usually have already had their faces insured for millions of dollars. The razor is made of pure iridium which is used in rockets and is the rarest earth metal. Only three tonnes of it can be extracted every year against over 2,600 tonnes of gold annually. Interestingly, you won’t need any replacement cartridges as the blade is guaranteed for 10 years during which time the company will service and sharpen it for free. But if you want to glide this rocket metal razor on your face every morning you better hurry as it is in a limited edition of only 99. Are you a fitful sleeper who tosses and turns the night away? Here’s some good news for you. The Polar Pillow will gently lull you into dream land. The miracle pillow is filled with a cooling gel that extracts the heat from your head and slows down the brain’s hyperactivity to nod you off to sleep. The pillow stays cool for approximately two hours of use (long enough for you to fall asleep!) then gradually warms over the course of the night. It also helps soothe headaches, hot flashes, night sweats, fevers and skin irritations. Bid goodbye to sleepless nights as this special pillow will help you slip into Zzzsss. Steaming is the ultimate way of healthy cooking as food retains natural vitamins, minerals and moisture and negates the need for added fat. Seeing the urban lifestyle and increase in demand for non-fatty foods, Westinghouse India has launched food steamers for health conscious people to stay fit and trim. 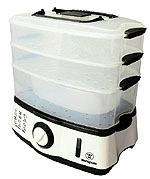 The steamer comes in a rectangle design with instant steam boost. It has one high and two low baskets for cooking grains, vegetables, fruits, eggs, seafood and meat. It also has a reheat button to warm food after cooking along with a rotary switch timer and bell alert. So go ahead, discard conventional cooking and steam your way to health.